It came down to the last day of the season but while Menifee’s colt Magnifique won Seoul’s big race to close the gap to just a few thousand dollars, Exploit is the Leading Sire in Korea 2011. It’s a first Leading Sire crown for the fifteen year old who came to Korea in 2005. He finished seventh on the earnings list last year but, with more runners on the track than any other sire in the country, this year he was always best placed to succeed Creek Cat as champion. However, with Menifee and Vicar in second and third – despite them both only having two crops of foals of racing age – in what was the closest race in years, it is likely to be a short reign for Exploit. While Menifee and Vicar held a near monopoly on the three-year old classics, a year behind them is Forest Camp. He was by far and away the leading first-crop sire and also walks of with the title of leading sire of two-year olds. Ecton Park and Peace Rules are both due on stream soon and will be followed by the likes of Officer. The future is looking bright for breeding here. American bred stallions accounted for none of the top ten money-earners with the Japanese Biwa Shinseiki occupying the final spot, due mainly to the continuing exploits of Dangdae Bulpae. * Five registered stallions passed away in Korea this year. They were Yankee Victor (USA), Ft. Stockton (USA), The Groom Is Red (USA), Tayasu Meadow (JPN) and Air Smap (IRE). 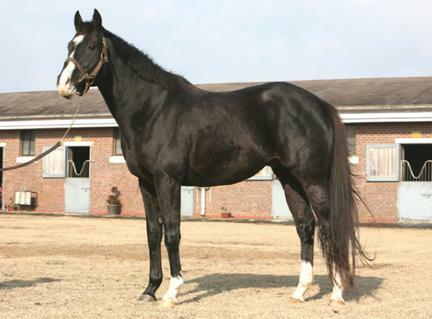 Ft. Stockton sired the 2007 Korean Triple Crown winner JS. 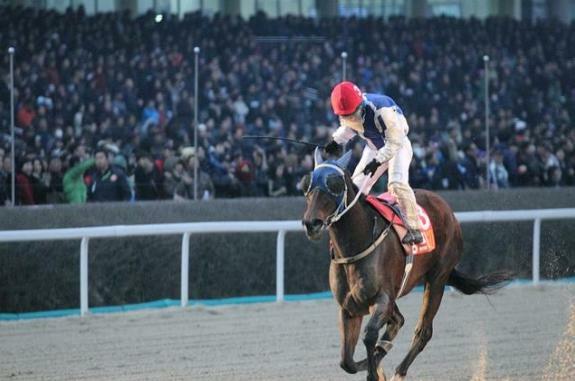 Hold while the best horse by The Groom Is Red was the hugely popular Classic winner Baekgwang. Just over a week ago, two formidable unbeaten records were intact. Now, as we head into the Christmas break, both are gone. Last week Mister Park saw his unprecedented 17-race winning streak come to a valiant end at the hands of Tough Win in the Grand Prix Stakes. 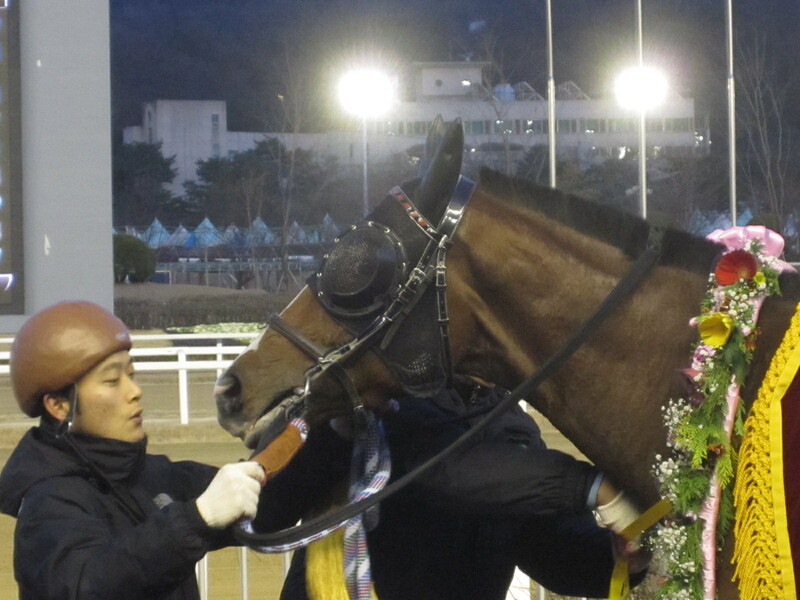 This week a horse who skipped the Grand Prix Lion Santa, was looking to make it a perfect 10 at Busan. He came unstuck. Maybe because it was the break before an extended break or maybe it was because Nonghyup’s sponsorship had added a few million won to the purse but this handicap attracted a stronger field than usual. Nevertheless, Lion Santa was still sent off as the odds-on favourite. He may have won it too, had he not been left in a poor position rounding the home turn. By the time jockey Kim Dong Young had found a way through, second favourite Jeonseong Sidae was uncatchable. Lion Santa rallied for second but the record was gone. Australian bred three-year old Jeonseong Sidae (Stromberg Carlson-Jessie’s Journey) is no mug. This was his sixth win from nine starts. As for Lion Santa (Lion Heart-Santa Fe Strip) the future is still bright, but connections may be wishing they’d taken the chance to go out in a blaze of glory at Seoul last week instead of with a whimper at Busan today. Up at Seoul it was also a quiet closing day. The feature race was won by Magnifique (Menifee-Miss Beauty) who was making his debut at class 1. Kept off the classic trail, Magnifique was a late developer but may well turn to be the best of what has been a disappointing three-year old crop in Korea his year. So that’s it for racing in 2011. While racing returns to the Korean peninsula on the first weekend of January, there’s an awful lot of news to catch up on before that which we’ll start to do this week. Tough Win ended the seventeen run unbeaten streak of defending champion Mister Park as he took victory in a thrilling renewal of the Grand Prix Stakes at Seoul Race Park this afternoon. The four-year old gelding was sent off third in the betting but made no mistake with a perfectly timed run as he came through late to overtake Mister Park in the final furlong and win by just over half a length. As expected, Tamna Ace made the early running but it was Akane Yamamoto and Mister Park who quickly took over at the front. In the backstraight there was excitement as Shim Seung Tae brought the two-year old prodigy, Smarty Moonhak up alongside the leader and these two were neck and neck as they rounded the home turn. Behind them though, Tough Win and Cho Kyoung Ho had begun to make their move. 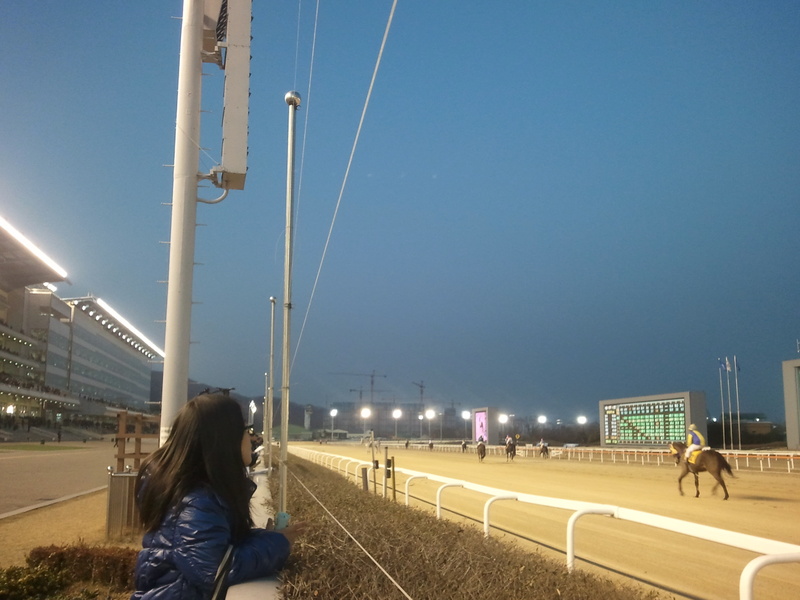 In the home straight, Mister Park managed to shake Smarty Moonhak but on the outside, Tough Win was always closing and when he went by, Mister Park had no response. It was a 14th win from 18 lifetime starts for Tough Win, a $12,000 purchase at the June 2009 Ocala Two-year old Sales. He suffered his first loss in this race last year and was out of the money for the only time in his career in this summer’s Busan Metropolitan. Today, however, everything came together as he scored the win his talent has always promised to deliver. Mister Park’s front-running style means he always runs the risk of not having enough left in the home straight. Akane Yamamoto managed to control his pace well but he simply couldn’t hold on. Completing the first three was the wildcard, Smarty Moonhak. In the build-up to the race, few people were talking about anything other than the first two-year old in the Grand Prix’s 30 year history to take his chance. Although he didn’t win, he proved he is the real deal. There’s no disgrace in being beaten by a pair such as Tough Win and Mister Park and, having stayed the distance, he was six lengths clear of the fourth horse home. Provided he stays sound, at this moment in time, it is hard to see anything beating him next year. Tomorrow morning, updated rankings will be published and Smarty Moonhak will find himself the first two-year old ever to be promoted to Class 1, the highest level of racing here. As for the others, 2010 Korean Derby winner Cheonnyeon Daero went quietly into retirement in 9th place while KRA Cup Classic winner Ace Galloper was a disappointing 11th. Peter Wolsley’s first attempt at a Grand Prix was not a happy one with the grey Gyeongkwaehanjilju tailing the field home in 14th. Today though was about three top horses. One has the Korean racing world abuzz with his potential and ran today like no two-year old should; one met with no disgrace as he saw his record-breaking winning streak come to a battling end. 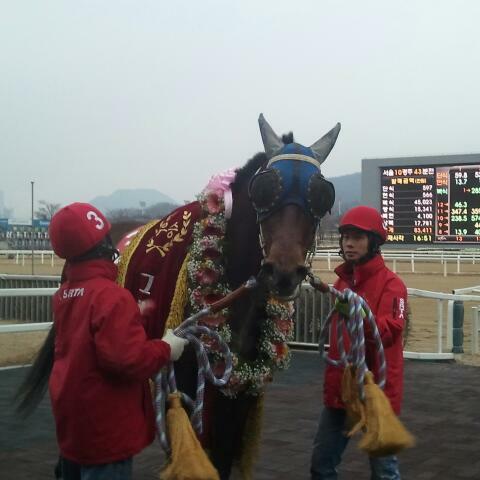 The other, Tough Win, is Korea’s Champion Racehorse of 2011. The Grand Prix Stakes is the highlight of the Korean racing year. It’s not the most valuable race but it is unquestionably the best. This year, we have the defending champion Mister Park, looking to stretch his unbeaten run to 18, an Australian trainer looking to make Korean racing history, and a two-year old who, if he is as good as his hype, could be the best thing we’ve seen on the peninsula for years. A really nice horse who would have a far better win record had his connections not been sportsmen and always run him in the most competitive company possible. Third in this race last year and winner of the Busan Metropolitan this summer but has put in three disappointing runs since. He can never be ruled out and could be a value bet. The only filly in the race is tough to recommend. 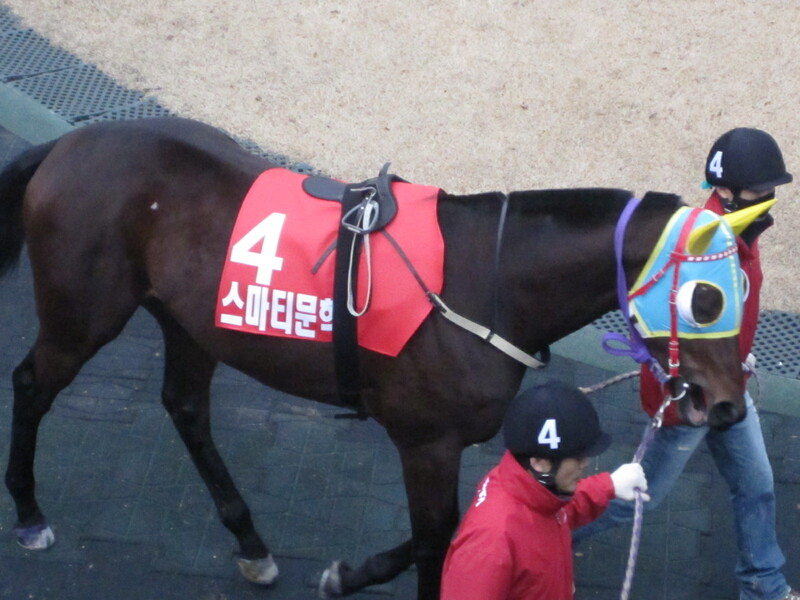 She was a well beaten fourth in the Gyeongnam Sinmun last month and is in far stronger company here. Last year’s favourite didn’t get the distance and in his last Stakes race got sucked into a ridiculous speed duel into the first corner with Dangdae Bulpae which left both of them exhausted, handing victory to Yeonseung Daero. He’s back in winning form though and, while the distance remains a concern, he’ll be among the top three in the betting for good reason. The wildcard. A two-year old has never even run in the Grand Prix, let alone won it. We knew Smarty Moonhak was a little different to most imports who win a few races easily as a juvenile when he trotted up in the TJK Trophy last month but jaws dropped when he was entered for the Grand Prix. He’s worked well and connections are adamant that the distance is no problem and he’s ready. It’s a big test for jockey Shim Seung Tae because if Smarty Moonhak does indeed stay the distance, things are going to get very interesting. A potential superstar, there’s no downside to this colt. Except that he is two. This will be the final race for the 2010 Korean Derby winner before he is retired to stud. The trouble with him is that he keeps on coming second – he’s been runner-up in his last five races. He’s a very good bet to be second again but winning may be pushing it. If he did, however, it would be a fine finale to a very fine career. A good solid performer, while he’s got the stamina, he perhaps hasn’t got the speed that will be needed at the end of this race. A placing chance. He’ll likely make the early running so will certainly have a big impact on the outcome of the race. Not a whole lot to recommend this one. Has been in poor form since winning a handicap in Septemebr and on paper is the weakest of all entrants. A perennial placer, Triple Sinhwa will be hard pushed to achieve that here. Second to 2008 Derby Winner Ebony Storm last time out, the competition should be too strong. The defending Champion. The favourite. He’s won his last 17 races, a Korean record but this is his toughest test. Akane Yamamoto has the chance to become to the first foreign jockey to win the Grand Prix and she’ll have to be at her best here. Mister Park likes to start quickly so it will be important that he doesn’t get sucked into an early speed battle. Get this right and in the home straight, he has all the weapons needed to become the third horse to win two Grand Prixs and take that record to eighteen unbeaten. A late developer, this is his first ever start at class 1. However, he should find himself outclassed here. He’s the half-brother of 2005 winner – the legendary Subsidy, last son of Mr Prospector, who cut his teeth on the inner-dirt at Aqueduct in New York before being brought to Korea to be a champion – but Jumong is a decent horse in his own right. The distance counts against him and there are others with better claims – he was well beaten by Ace Galloper in the KRA Cup Classic – but there may be some place value. That he’s the only three-year old Classic winner to make it to the Grand Prix isn’t his fault. However, it’s been a disappointing year for Korean bred three-year olds. He looked to be flying as they turned for home in the President’s Cup at Seoul last month but he ended up finishing almost last. It would be a big surprise if he returned to form here. Peter Wolsley has the chance to become the first foreign trainer to saddle a Grand Prix winner. 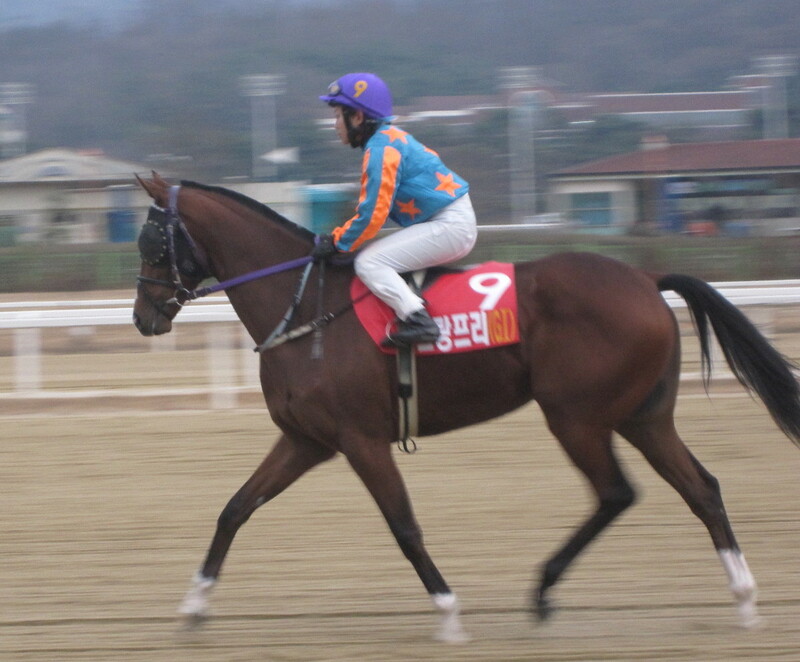 The best horse Wolsley has trained in Korea, Gyeongkwaehanjilju is in great form and will love the distance. While he would be easier to bet had intended jockey Nathan Stanley not been suspended and had Jo Sung Gon, his previous regular rider, come to Seoul. 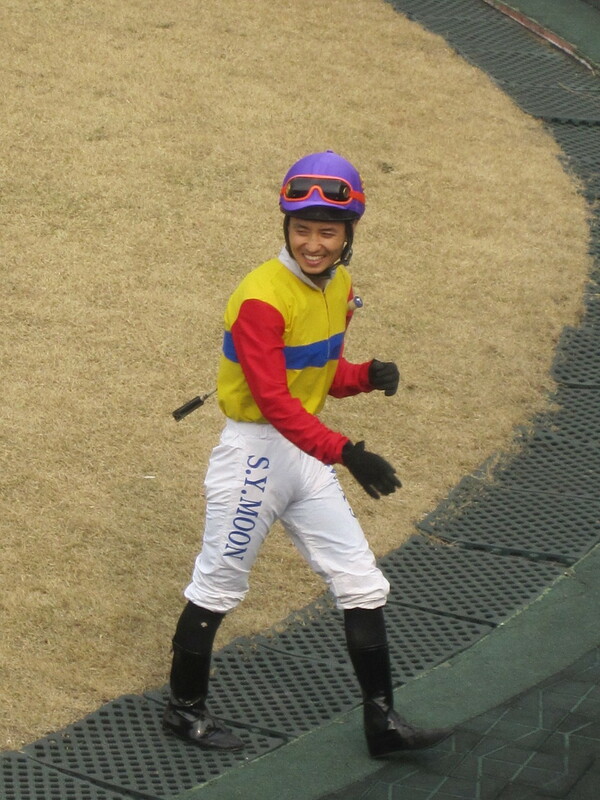 Nevertheless, Wolsley’s stable jockey Kim Nam Sung gets the biggest chance of his career so far. The KRA Cup Classic winner and one of Mister Park’s biggest threats. The distance is a concern but the talent isn’t. If he’s there at the end, he’ll be very difficult to beat. Gyongmaman’s verdict: Mister Park must be favourite to successfully defend his title and must be the pick for the win. Smarty Moonhak is the one to watch as a racing fan for the great story it would be but is not one to bet as a hard-hearted punter. The same is true of Gyeongkwaehanjilju. The value may lie with Yeonseung Daero. Veteran Japanese jockey Toshihiko Inoue made the perfect start to his time in Korea, scoring a victory on his debut at Seoul Race Park today. The 47 year old has notched over 1500 winners in a career dating back to 1983 and comes to Seoul Race Park on an initial four-month license. 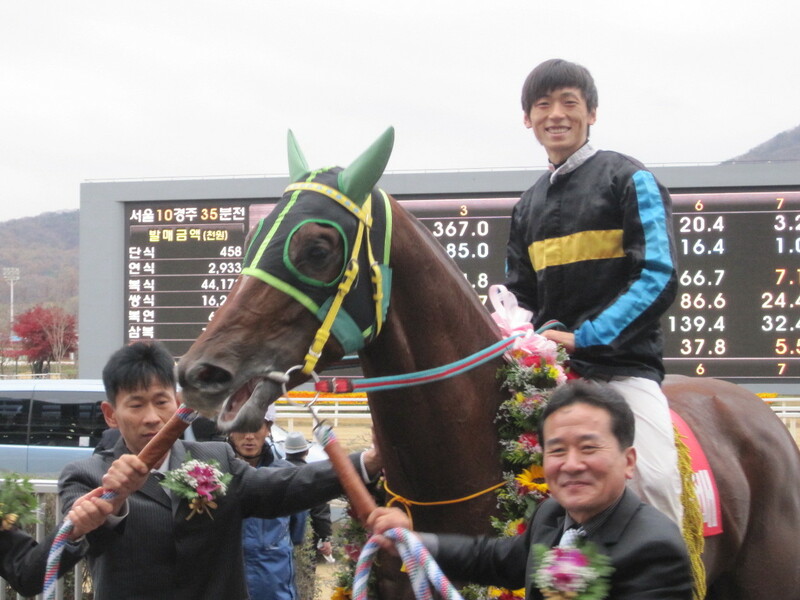 Inoue had six rides today and started off by scoring a shock second place in race 1 on 30/1 outsider Huimang Daejakjeon. His win came in race 7, when he drove home 7/1 chance Gigomamnjang by a neck in a tight finish. Inoue joins fellow Japanese riders Makoto Noda and Mai Beppu at Seoul. Noda has had a tough time, landing 6 wins from 258 rides while Beppu – who has proved popular with the local trainers (not to mention certain top jockeys) has scored 13 from 236, including one today. Down at Busan where the locals are generally more amenable to foreogn riders, Eiki Nishimura and Akane Yamamoto are both enjoying successful spells. Akane will be in Seoul on Sunday to ride Mister Park in the Grand Prix Stakes. Inoue has a further five rides on Sunday. The final field for Sunday’s Grand Prix Stakes has been confirmed and there have been no drop-outs from the public vote result that was announced last week. Defending Champion Mister Park heads the field while likely main rival Ace Galloper also goes. American import Smarty Moonhak will become the first two-year old to contest the rest.